To everyone, wherever you are in the world, welcome to the Christmas edition of Meezer Musings! Here's Bandit, sending you his best wishes too. So what's in this month's newsletter? 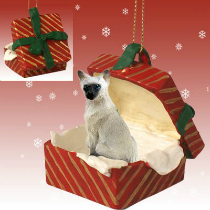 I have some news to share with you about Bandit's health, we have our usual Meezer of the Month and Fun from Facebook features, and as our thoughts are now turning to Christmas and other festivities there are some topical tips for keeping your cats healthy and safe over the holiday period. 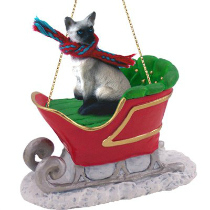 And because it's that time of year, we're taking a look at some Siamese cat-related products and gifts you might enjoy. I hope you have fun browsing through them. A friend of mine reminded me that there are only 21 sleeps till Christmas, which does tend to focus the mind on everything that needs to be done before that. As I mentioned at the end of the previous newsletter, Bandit had to go to the vet for a dental in October. This should have been a routine scale and polish but while this was being done, the vet discovered several resorptive lesions on the inner jaw (where they couldn't be seen in a normal examination) and five teeth had to be taken out as a result. More worryingly, Bandit's blood tests showed the early signs of kidney disease. 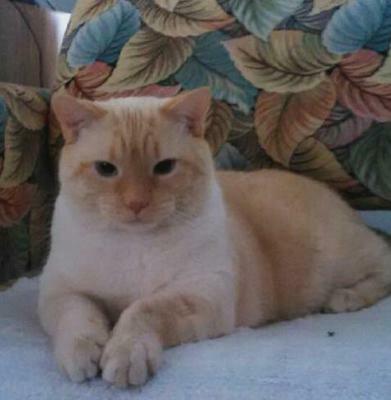 Several cat breeds are more prone to kidney disease than others, among them Siamese, but many cats, whatever their breed or background, seem to end up with a loss of kidney function - some earlier, some later in their lives. Once the kidneys start to deteriorate, the aim is to keep your cats as healthy as possible for as long as possible with a good quality of life; there's no 'cure' and no accurate prognosis in terms of life span, but much can be done to slow the progression of the disease. So we're just starting down that road, and I'll write more about this next year. Being told your cat has kidney disease is worrying, difficult to come to terms with and a huge learning curve. What foods to feed? What supplements might help? What can you expect? The good news is, you don't have to go it alone. For anyone in the same situation right now, here are two resources I've found very helpful. One is the website Tanya's Comprehensive Guide to Feline Chronic Kidney Disease, which, as its name suggests, is very comprehensive with all sorts of extremely useful information; the website takes you gently by the hand and offers encouragement and help. For further advice, the Facebook group Feline Chronic Kidney Disease has many very knowledgeable and supportive members, all of whom are going through, or have already been through, everything that you're experiencing. We all hope (and would like to believe) that our cats will live good long lives and always be with us. Life doesn't always live up to our expectations, though. 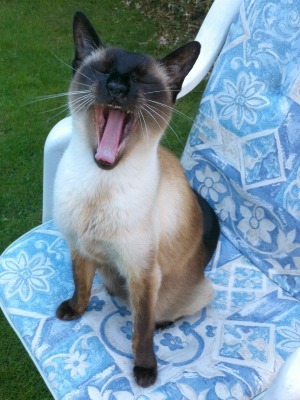 Our Meezer of the Month story is from Donna O'Connor, who wrote about her beautiful boy Shadow, her 'gift from God' - and sent us this lovely photo of him. Sadly, Shadow died of congestive heart failure earlier this year, while still relatively young, but while he was with them, he brought enormous happiness to Donna and her family. You can read more of Shadow's story here. Christmas and other holiday festivities will soon be with us. 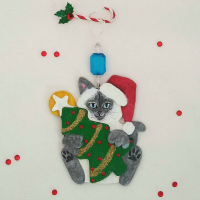 I love looking around for Siamese cat-related gifts and seeing what's on offer - so, whether you're shopping for family members, your cats or yourself, here's a selection of ideas to get you in the holiday mood! You may remember that last month I featured Suzanne Le Good's annual calendar and her Christmas cards are always very popular too. 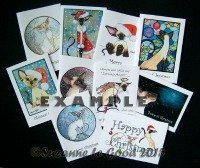 They're sold in packs of 10 assorted designs and are available from Suzanne's Etsy shop. 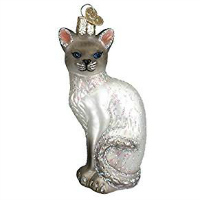 Although Christmas trees and Siamese cats don't always mix (see our topical tips), I do love tree ornaments and there are some very pretty little Siamese cat ones around this year. Here are some of the cutest! For sale on either Amazon or Etsy, click the images (or links beneath them) to find out more about them. These little meezer hair ties proved popular last year and they're still available, so we're including them again. 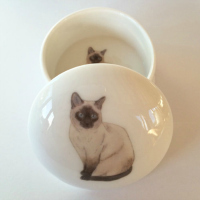 For all Siamese-cat-loving girls of any age! They're not expensive and would make a great stocking filler. You can also buy trinket boxes to match. And speaking of stockings, how about this one? 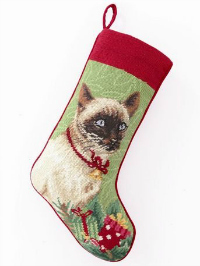 A hand-crafted, needlepoint (already done for you, no crafting required) Siamese cat stocking to hang from the mantelpiece, all ready for Santa. I adore the Skippyjon Jones series by Judy Schachner, but there's a less well-known book of hers, The Grannyman, which is wonderful too. 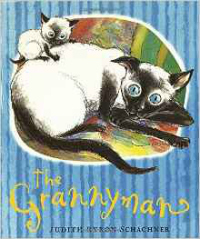 Based on two of Judy's own cats, The Grannyman is the story of what happens when Simon, a very old, much-loved Siamese cat is presented with a kitten of his own to care for. I've recently discovered Etsy, an online crafts store, and love some of the things you can find there! 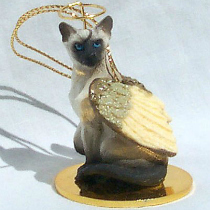 Here are just a few examples of Siamese cat gifts, from the least to the most expensive. How cute is this?! 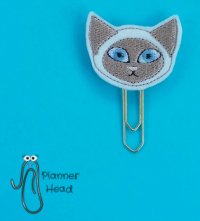 A paperclip with a Siamese cat head, this could be used as a bookmark, a diary or planner page marker, or even, just as a paperclip! Available on Etsy from Plannerhead, who also have lots of other equally cute designs. If paperclips aren't your thing (or perhaps you need something to store your paperclips in!) I thought this bone china trinket box was rather lovely, and not at all expensive. Designed and made by Kimberley Snelling on Etsy. 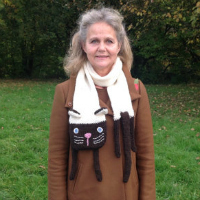 Very appropriate for these winter months, how about a Siamese cat scarf? Hand-knitted from pure wool, for those of us who'd like to take our cats with us everywhere we go! Designed and knitted by GnawsKnits on Etsy. 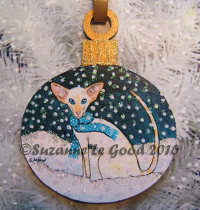 I've always loved Fazio's Cat Jewelry; their designs are wonderful and if I could afford them I'd have them all! 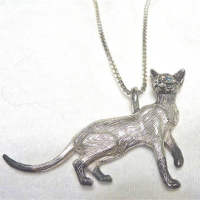 Here's their sterling silver Siamese cat pendant, for which you can choose appropriately colored gemstones for the eyes. The chain is not included. On Etsy by Fazio's Cat Jewelry. Finally, a reminder about two novels we've featured this year; books about Siamese cats are always popular and these two would make lovely gifts for any cat-lover. 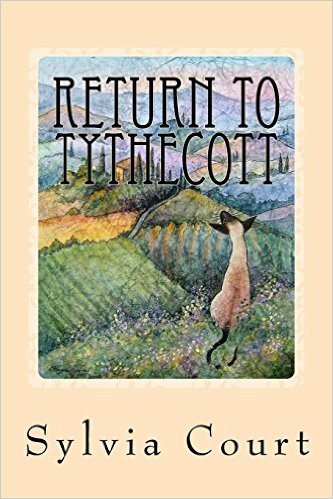 Return to Tythecott is a relative newcomer to the Siamese cat book scene (we featured it in October) - it's the story of Rufus, a Siamese cat who accidentally finds himself out on the streets. Follow his adventures as he tries to find his way back to his owners and a home life again. 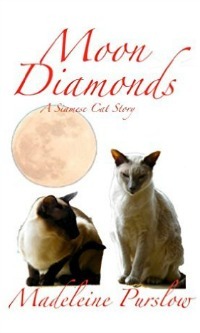 Moon Diamonds by Madeleine Purslow is also a lovely read for all Siamese cat lovers. Very sadly, Queen Theda, the lilac point featured on the cover of the book, died recently. Owner Maddie is of course heartbroken and I'm sure you'll all join me in sending her our condolences. 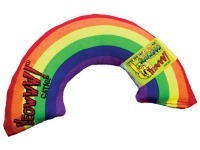 For the cats in your life ... including Bandit's most favorite toy ever! Yeoww! Catnip Rainbow. Bandit adores these; we're now on his third! Sturdy and well-made, although they don't last forever, which is probably why they also come in packs of three, but they last a good long time and the catnip is very potent. 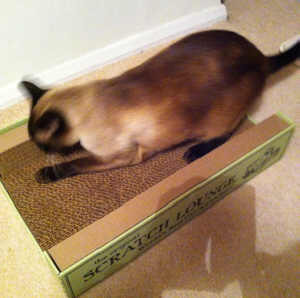 Another of Bandit's favorites, the 'World's Best Cat Scratcher' or Scratch Lounge was an instant hit with him, he loves it even more than cardboard boxes! (And he really loves those.) Not a good photo, but you can at least see him in action on it! These little Miyoni Plush Siamese are so cute - they're made for kids but they're also great for cats; I've heard from several people that their kitties adore them and carry them around as they would their own kittens. Worth a try if you have an 'only' cat! Christmas and other festive holidays tend to be times when there are all sorts of unusual foods, plants and other temptations around the house, so here are some thoughts and reminders on keeping your cats safe and happy during all the festivities. Christmas lights. 1. Make sure that electrical cables are kept well out of the way, either hidden under rugs or covered with cable protectors. 2. Use circuit breakers. 3. Never leave trees with lights unattended, especially if you have kittens. Kittens have been known to hang themselves by getting tangled up in light cables. Christmas candles. Don't leave lighted candles unattended or in places where they might accidentally be knocked over and start a fire or injure your pet. Christmas decorations. Make sure any ornaments or other decorations you buy are non-toxic and don't contain small pieces that could get stuck if your cats try to eat them. Christmas foods. Chocolate, cake, candies, cookies, nuts, alcohol - none of these are good for cats! Ingredients in other foods - raisins, sultanas, onions and garlic are toxic too so avoid feeding your cats any foods that contain these. If in doubt, cat food is better than human food for cats! Christmas gifts. Cats love to 'help' you wrap Christmas gifts, but make sure they don't accidentally swallow tape, string, paper or any other wrappings, and tidy up after yourself. And, once wrapped, don't leave packages containing foods or treats under the tree - they're sure to be discovered and devoured! Christmas visitors. If you're expecting visitors, make sure your cats have a calm, safe space they can retreat to, and, as always, make sure they can't escape through open doors. Vets' opening hours. We sincerely hope you won't need to call the vet, but it's always a good idea to make a note of your regular vet's opening hours as well as the availability of emergency vets over the holidays, just in case. 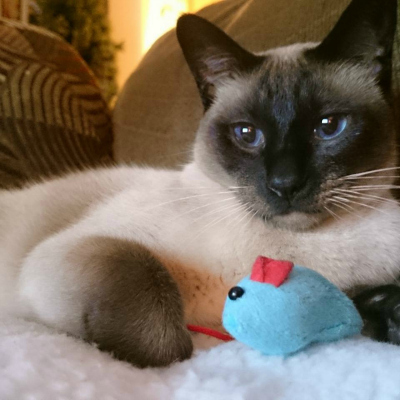 In keeping with our holiday gifts and toys theme, our Christmas Fun from Facebook slot features Blair J. Whiffen's boy Tuvoc, seen here with his favorite toy mouse. A very handsome boy and a lovely photo - thanks so much for sharing it with us, Blair. If you've already bought your Christmas gifts I envy you as I still have to make a start on it all. 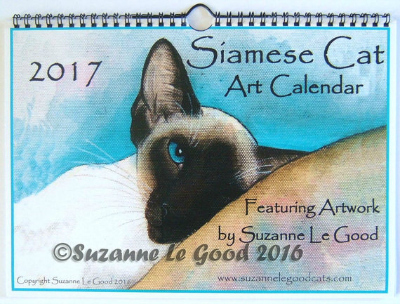 But one thing I have already bought (for myself) is Suzanne Le Good's 2017 calendar. I've put it away till January but must admit to having had a sneaky peak inside and as always, it's full of wonderful Siamese cats. Suzanne's calendars are available from Etsy, and it's not too late to order yours if you'd like one too. This is the last Meezer Musings of the year; December always seems to fly by with preparations for Christmas and for us it always involves a lot of traveling as well. We'll be back towards the end of January, but meanwhile we hope you have a very happy, peaceful and joyful holiday season in whatever way you'll be celebrating it, whether that means you're knee-deep in snow or, for our Australian friends, barbecuing on the beach. For us in the UK, Christmas is very often gray and wet, but I'm hoping for a white Christmas!